Place butter, brown sugar and corn syrup in a large microwave-safe bowl. Microwave on high for 2 minutes. Remove from microwave, stir and add marshmallows, stirring to coat. Microwave for 1 minute. Stir and microwave an additional 1-2 minutes until marshmallows are completely melted and mixture is bubbly. Pour marshmallow caramel over popcorn in a large bowl. Stir to coat. Spread coated popcorn on a cookie sheet sprayed with nonstick cooking spray. Sprinkle 1 cup chopped pretzels on top of coated popcorn. In a microwave-safe bowl, melt chocolate for 30 second intervals, stirring after each, until melted. Drizzle over popcorn then sprinkle with remaining 1/2 cup chopped pretzels and sea salt. Place pan in refrigerator for 5-10 minutes to help set chocolate (or leave it on the counter for 20-30 minutes). Do you ever get in one of those moods where you can’t decide what kind of snack you want? Sweet? Salty? Crunchy? Chewy? Well, this ridiculously easy Caramel Pretzel Popcorn is my new favorite treat because you get EVERYTHING! 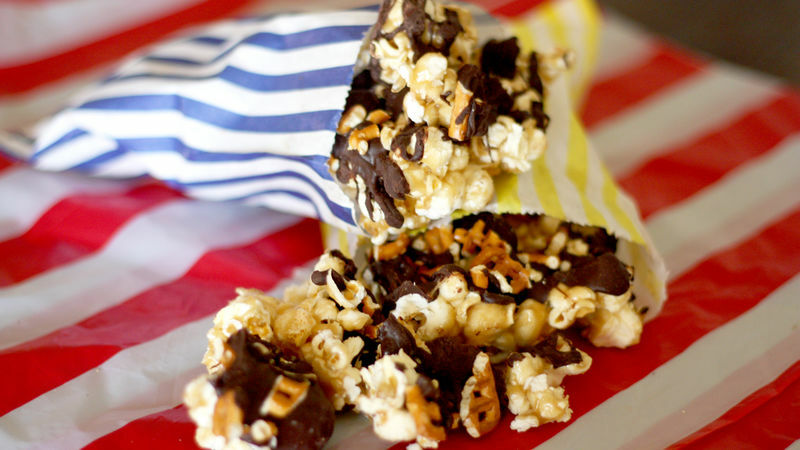 Sweet and chewy marshmallow caramel corn topped with crunchy pretzels, semi-sweet chocolate and a sprinkling of sea salt. Heaven! I usually love sharing yummy food but I’m not gonna lie… after I took photos of this batch, my husband and I quickly sent the kids off to bed and devoured the whole thing by ourselves. And I’d do it again in a heartbeat. Sorry kids, you’ll have to make your own. The good news is that recipe is so easy that my 8-year old can do it herself. Often when you make caramel corn it involves using a stovetop, then baking it in the oven for an hour or so. This recipe only uses the microwave and start to finish is 20 minutes or less! Pop it in the fridge or freezer for a few minutes to set the chocolate (or leave it on the counter for 15 minutes or so but we don’t like to wait that long) and it’s snack time!